I wasn't sure what I could make for this months Can-Jam Herb theme, I was a little stumped. The only thing that kept coming to mind was mint jelly... and I'm not exactly a fan. So I remembered a post from last months Allium Can-Jam for a Garlic & Lemon mustard.. I loooove mustard, and have quite a few different jars on the go at one time, but I have never tried making my own, until now. After flipping through my books I landed on a recipe that sounded like it would be a winner, Lemon, Sage and white wine. The only adaptation I made was replacing a 1/4 cup of the yellow mustard seeds with brown, simple reason... I was short on yellow mustard seeds and had a bunch of brown seeds on hand. 1 - Finely chop enough sage leaves to measure 1/3 of a cup and set aside. 2 - Coarsely chop remaining sage leaves and stems to measure 1/2 cup and place in a stainless steel saucepan with the wine. Bring to a boil over medium heat, stirring and pressing the leaves to release their flavours. Remove from heat, cover and let it steep for 5 minutes. 3 - Transfer sage infusion to sieve placed over a glass or stainless steel bowl and press the leaves with the back of a spoon to extract all the liquid. Discard the solids and return the liquid to the saucepan. Add the mustard seeds . Cover and let them stand at room temperature until the seeds have absorbed most of the liquid, about 2 hours. 4 - Prepare canner, jars and lids. 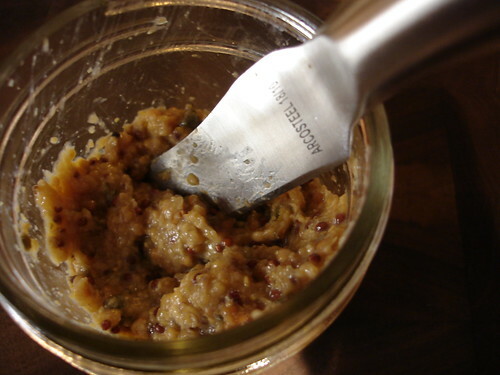 5 - In a blender (or food processor fitted with a metal blade), combine the marinated seeds and liquid with vinegar. Process until blended and most seeds are well chopped, I kept a slightly grainy texture. 6 - Transfer mixture back to the saucepan and add lemon zest, lemon juice, honey, salt and reserved chopped sage. Bring to a boil over high head, stirring constantly. Reduce heat to low and boil gently, stirring frequently, until volume has reduced by a third, about 20 minutes. 7 - Ladle hot mustard into hot jars, leaving 1/4 inch of headspace. Process jars for 10 minutes.